As a Member of LiUNA!625 you can take great pride in the magnitude of manpower and depth of skills you contribute to support the resurgence of economic growth throughout southwestern Ontario. LiUNA!625 Members build communities better and faster because of our Safety First priority on every site, comprehensive skills training and vast experience. A huge plus that gives our signatories a competitive edge and increased contract opportunities. As a Member, the Union’s destiny is in your hands. You elect the leadership, participate in daily affairs, set priorities for Union contracts, drive growth and market share and strengthen cooperative partnerships with contractors. Our Members are the heart of our organization, the forefront of the construction industry and the backbone of our community. An exceptional Union with the power to make a difference. Send us your Email address and stay connected to LiUNA!625 for news and information, Member functions, ticket alerts, sports and entertainment events, merchandise deals and other good stuff! Your email address will not be shared with any third party. WARNING: Please be aware that if you or any member in your family have received a package in the mail from American Income Life Insurance Company (AIL) with a Free Offer, and you or anyone in your family signs the offer and returns it to AIL, you have granted them permission to contact you. By signing this offer and granting AIL permission to contact you, an AIL sales representative will be on your doorstep selling additional insurance products and hounding you or your family until you make a purchase. AIL and it’s sales representatives are not authorized by LiUNA!625 to solicit LiUNA!625 Members. If you or a member of your family are being harassed by AIL sales representatives please contact the LiUNA!625 office. Attention Members: (As of July 1,2014) Ministry of Labour MANDATORY Health and Safety Awareness Certificate-FREE Online Training… Click for details. 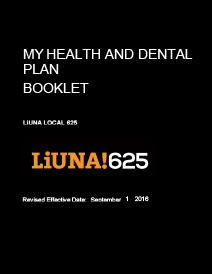 LiUNA!625 Members enjoy the best health care benefits in Canada. We wouldn’t have it any other way! In fact, taking care of our Members and their family’s health is a priority when we negotiate contracts with employers. And when temporary illness, layoff or disability, you and your family are covered. Greenshield is a benefit specialist committed to providing effective cost containment strategies, advanced technology, and exceptional customer service. They administer benefit plan programs for 1.7 million plan members nation-wide. Get to know your benefits. They’re the best in the Country! The Labourers’ Pension Fund of Central and Eastern Canada was established in 1972 and has grown to become one of the top 10 managed pension funds in Canada with $ 5.3 billion in assets. 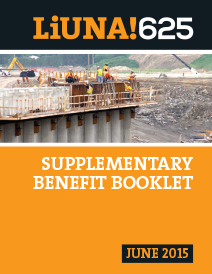 LiUNA!625 Members and their families can be assured of the utmost dedication of the Fund managers to ensure their welfare and security and commitment to provide the highest level of service in administering their pensions. You must notify the LiUNA!625 office and the Labourers’ Pension Fund office. You must complete the Re-Employed Pensioner- Notice of Election Form* available at the LiUNA!625 office. please have your SIN number available. Get to know your business reps. They are your primary contact to help resolve issues between you and your employer within 48 hours in a manner that is fair and equitable to everyone and if possible, without having to proceed with an official written grievance.